David Garcia is a candidate for the Governorship of Arizona. He served as a research analyst for the Arizona State Senate and leading the Arizona Department of Education as Associate Superintendent. After graduating from the Honors College at Arizona State University, Garcia received a master’s and doctorate from the University of Chicago and has become a nationally-recognized expert in education research and policy. 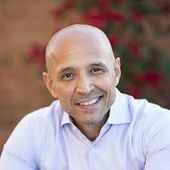 Garcia serving as a research analyst for the Arizona State Senate and leading the Arizona Department of Education as Associate Superintendent. In 2014, the Arizona Republic called David a “Champion for Education.” Now, he is a professor in the Mary Lou Fulton Teachers College at Arizona State University where he teaches research and policy to Arizona’s next generation of leaders. The closest Democrats got to winning a statewide race after 2008 was in 2014, when David Garcia fell 16,000 votes short of defeating Republican candidate Diane Douglas in the race for state superintendent of public instruction. Of course, presidential contests operate under vastly different dynamics than local contests. But the superintendent’s race was supposed to be winnable for Democrats. Against a polarizing figure who vowed to abolish the Common Core education standards, Garcia emerged as the establishment’s consensus candidate. Two former superintendents, both Republicans, endorsed him. So did the Arizona Chamber of Commerce and Industry, which rarely backs a Democrat in a statewide race. With E-ka Toussaint, Cesar Aguilar, Jessica Mendoza, Barbara Sofia, Shayna Stevens, Nic Parra, Lex Allen, David Garcia, Kristy Ann Silva, Michael Martinez and Patrick Morales. The highlight of yesterday... Dr. David Garcia! ASA met with Dr. Garcia to discuss how we make higher education more affordable and accessible for all. We discussed education policy that is being drafted for 2018-2020. We also discussed Dr. Garcia’s plan to make community colleges in Arizona free! A plan we at ASA, believe can work. ASA has worked with Dr. Garcia in different capacities over the years as he is a nationally recognized expert in education research & policy, an ASU professor and now a candidate for Governor of Arizona. We’re looking forward to working with Dr. Garcia in the coming weeks. Stay tuned, amazing things are around the corner. FreeHigherEd #ASA #ASU — with Kieran Elia, David Garcia, Cesar Aguilar and Shayna Stevens. Belen Sisa was David Garcia for AZ Superintendent of Public Instruction, Volunteer. Feb 2014 – Nov 2014. Shayna Stevens, April 12, 2017. I proudly support David Garcia for Governor. We share one very important thing in common: Our belief that public education is the great equalizer. — with David Garcia at Arizona State Capitol Buildings. In 2016 David Garcia supported Bazta Arpaio. Arizona’s governorship is a tantalizing pick-up possibility for Democrats. Donald Trump beat Hillary Clinton by only 4 points, and the incumbent governor, Dave Ducey, is polling badly, largely because of the GOP’s deep cuts to the state’s education budget. Arizona now spends about $4,200 less per pupil than the national average, and at press time, there were rumblings of a statewide teachers’ strike. Education Week recently gave Arizona schools an overall grade of D+, ranking it sixth-worst in the nation. It wasn’t until the early 1990s that the Latino population of Arizona began to take off. Bill Scheel, also served in the role for a time. Fern Zelmanovics Ward, July 5, 2018. Arizona Legislative District 27 Democratic Committee is in the house! 270,000 signatures and lots of new friends later, #InvestInEd is on the ballot! (Theoretically). Thank you everyone who made it happen! — with Reginald Bolding, Ronda Olson, David Garcia and Donna Perea. Belen Sisa April 2, 2018. With Edder Diaz Martinez, Oscar Hernandez Ortiz, Vasthy Lamadrid, Erika Andiola, Perla Martinez, Alex Baker, Cormac Doebbeling, Jocelyn Gallardo, Isela Blanc, David Garcia, Jake Bell for Arizona, Korina Iribe-Romo, Isa ONeal, Karina Ruiz and Garrick McFadden at Arizona Supreme Court. Going home for three hours. What a great trip to Phoenix! Got to spend time with some of the best organizers, friends, and family. Excited about the possibilities! This is David Garcia and he is running for Governor of Arizona! — traveling to PDX with Lew Granofsky, Brendan Walsh, Caitlin Elly Breedlove, Tomas E. Robles, Jr., Marisa Franco, Marco Garcia, Judy Davila, John Loredo, Ian Danley, Roy Herrera and Sarah Michelsen from Phoenix Sky Harbor International Airport. Join us in welcoming David Garcia, Democratic Candidate for Arizona Governor in 2018. Nov 03 2017, 6:30 pm - 8:30 pm. Philanthropy Center, Northwest Health Foundation 221 NW 2nd Ave #300, Portland OR. Democrats appear to have handed Republicans a major opportunity with their recent calls to “abolish” Immigrations and Customs Enforcement, the division of the Homeland Security Department charged with enforcing immigration laws at home. Many Democrats in Congress have backed the call, and in early July, Garcia threw his weight behind the campaign as well. Garcia is endorsed by People's Action, Working Families Party. PowerPAC.org is committed to supporting the civic engagement of voters of color and the election of progressive leaders of color. Much of our strategy is outlined in the book “Brown Is The New White,” written by our founder Steve Phillips. Our work involves researching where votes of color can make a difference in races, how demographic trends can affect change in public policy and leadership, and how civic engagement methodologies can change how campaigns are run. Our work has spanned the nationwide (support for Barack Obama and civic engagement in 18 states in the 2007-2008 cycle) to the small (unseating 18-year conservative incumbents in city races in San Bernardino, CA). Most recently we worked with grassroots activists in Georgia to encourage African American voters to turn out in the CD-6 race in Georgia and to build support for Stacey Abrams’ race for Governor there. As we move forward, we will deepen our work in California as well as launching a multi-state initiative to support gubernatorial candidates of color in GA (Stacey Abrams), MD (Benjamin Jealous), AZ (David Garcia), CA (John Chiang), and FL (Andrew Gillum). Additionally, we are in the process of building a fundraising engine to drive donations by average citizens in low dollar amounts. We think that there is power in crowd-sourcing the support of our communities of color. The voice of the growing economic power of the communities of color must be heard and their power felt. Democracy for America has 68,405 members in the state of Michigan and more than one million members nationwide. As a part of its work in the 2018 election cycle, Democracy for America intends to raise and spend more than $12 million in support of progressive candidates, make more than 2 million voter contacts, and support more than 250 candidates nationwide -- like Abdul El-Sayed -- in running inclusive populist campaigns committed to turning out the New American Majority of people of color and progressive white voters in November. El-Sayed is the sixth gubernatorial endorsement DFA has made in the 2018 election cycle. Other gubernatorial endorsements the national grassroots progressive group has made this cycle includes Stacey Abrams in Georgia, David Garcia in Arizona, Andrew Gillum in Florida, Ben Jealous in Maryland, and Paulette Jordan in Idaho. David Garcia, a Democratic candidate for governor, held a fundraiser late June 2018 at the San Francisco home of Tom Steyer, the California billionaire who is spending part of his fortune to influence Arizona’s elections. Garcia’s campaign would not say how much money was raised at the fundraiser at Steyer’s home, nor how many people were at the Monday night event. Steyer, a former hedge fund manager turned philanthropist and political activist, is funding a ballot initiative that would mandate Arizona utilities use more renewable energy, and has opened an Arizona branch of his national political organization aimed at the youth vote. A spokesperson for the Garcia campaign, Sarah Elliot, said the fundraiser follows a trend of left-leaning voters nationally taking an interest in Arizona politics. Elliot said she expects Garcia, if he makes the general election, would face a barrage of out-of-state money supporting Gov. Doug Ducey. Both Steyer and his wife, Kat Taylor, contributed $5,100, the maximum possible under state law, to Garcia's campaign on March 30. Garcia has trailed both Ducey and one of his Democratic primary opponents, state Sen. Steve Farley, in fundraising. According to the most recent campaign finance reports filed in April, Garcia has raised $543,702 during his campaign; Farley reported raising $778,393. The third Democratic challenger, Kelly Fryer, who entered the race in January, months after her opponents, has raised $109.357. Ducey has reported raising more than $3.3 million for his re-election campaign. Ducey, speaking at a brief news conference on Wednesday, said that voters could judge Steyer’s views for themselves. Steyer also has started an Arizona chapter of NextGen America, an environmentally focused political advocacy group that aims to engage the youth vote in the state. It opened a Phoenix office in June. Garcia appeared at the Monday fundraiser at Steyer’s home alongside Steve Phillips, founder of the political action group, Democracy in Color. Phillips, in a column published by The Nation last week, touted Garcia’s candidacy saying that his presence on the ballot would energize Latino voters. “Electing David Garcia — a person who comes from the very community Trump demonizes and who is unapologetically committed to building an inclusive, multiracial democracy — will represent a resounding rejection of the nativist, nationalist, and racist impulses lifted up by this president,” Phillips wrote. Garcia appeared on a Democracy in Color podcast taped in Phoenix. In the episode, posted last week, Garcia said it was important for a Latino to become the state’s chief executive. Garcia said, on the podcast, that when he ran for Superintendent of Public Instruction in 2014, political advisors told him that his last name would prove a barrier to winning a statewide election. Stacey Abrams, Alexandria Ocasio-Cortez, Benjamin Jealous and others appear to be part of a trend among minority candidates who have defeated moderate Democrats by campaigning on liberal policy priorities. Part of that strategy is recognizing the that there is often a gap between eligible Democratic voters and the margin of victory, said Steve Phillips, author of "Brown is the New White: How the Demographic Revolution Has Created a New American Majority". This page was last modified on 23 January 2019, at 03:45.